The first stage of a five-year $3.7 million expansion of Redlands IndigiScapes Centre at Capalaba kicked off today with the turning of the first sod for a bigger and better native plant nursery. 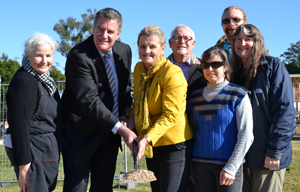 Redland City Mayor Karen Williams and the Hon Mark Furner, Minister for Local Government and Aboriginal and Torres Strait Islander Partnerships, today turned the first sod to mark the commencement of work. Redland City Mayor Karen Williams and the Hon. Mark Furner, Minister for Local Government and Aboriginal and Torres Strait Islander Partnerships turn the first sod at the site of the new IndigiScapes nursery. They are joined by centre volunteers Jan Armstrong, Ron Dunlea, Penny White and Maureen Tottenham and nursery employee Ben Webb (second to right). Mayor Williams said she was excited to see the IndigiScapes expansion under way after Council approved the master plan last November, and was grateful to the Queensland Government for its contribution to the first phase – the nursery upgrade. “The IndigiScapes nursery is quite unique in that it specialises in sourcing and propagating local native plant species. That makes it a vital source of stock for Council’s ongoing planting program throughout the City,” Cr Williams said. The existing nursery will be relocated to its new site a little further away from the main centre building once the new shed, external shade structure, hot house and sales areas are completed and fitted-out early in 2018. Division 7 Cr Murray Elliott said habitat protection and wildlife preservation went hand in hand. “The nursery expansion will help boost supplies for our planting program, which will in turn improve our network of wildlife corridors. Planting sites will be selected to ensure plants thrive and become part of an established and self-sustaining ecosystem,” Cr Elliott said. “I thank Minister Furner for visiting IndigiScapes to see how the State Government’s investment is being put to use. While this nursery upgrade might appear to be a discrete project, the State Government funding does in fact have a real knock on affect in Council’s capacity to meet our environmental commitments. “IndigiScapes is a much loved community hub for Redlanders, with its many events, bush walking tracks, local botanical gardens, Bush Tucker cuisine, and picnic and nature play area. I look forward to its transformation over the coming years,” Cr Elliott said. The IndigiScapes nursery upgrade is jointly funded with a grant of $109,800 provided by the Department of Infrastructure, Local Government and Planning, and Council’s contribution of $77,200 to complete the shed and shade areas. Cr Williams said Redlands’ traditional owners, the Quandamooka people, would play an important part in the expanded IndigiScapes Centre, which will include a Welcome to Country picnic area that offers a space for traditional dance, entertainment and talks. “Council is currently in discussion with the Quandamooka Yoolooburrabee Aboriginal Corporation (QYAC) for authentic indigenous cultural heritage experiences to be held at IndigiScapes,” Cr Williams said. Posted in Environment and tagged IndigiScapes.